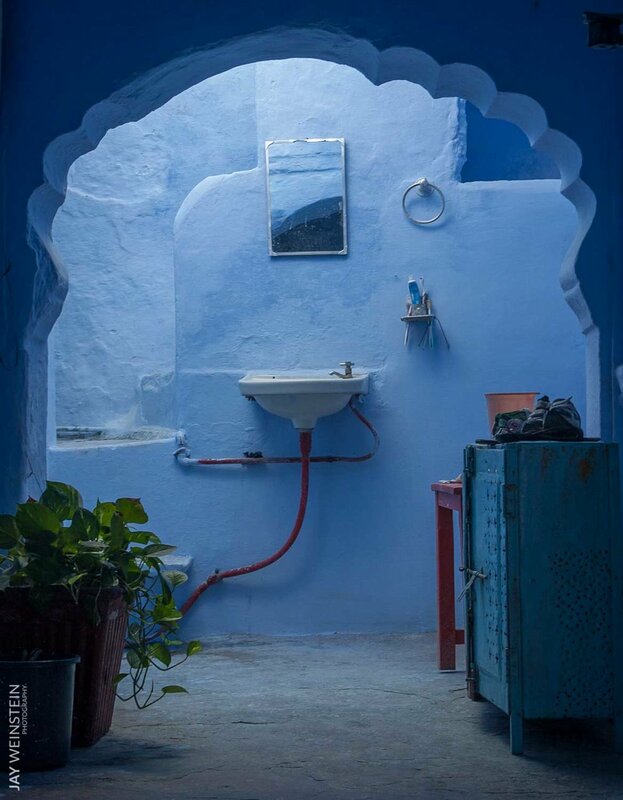 Explore the cultural landscape of India, camera in hand, and be enchanted by her commanding beauty, explosive energy and colorful contradictions, as we not only observe, but connect, with the people, architecture, and culture. You don't have to be an avid photographer. 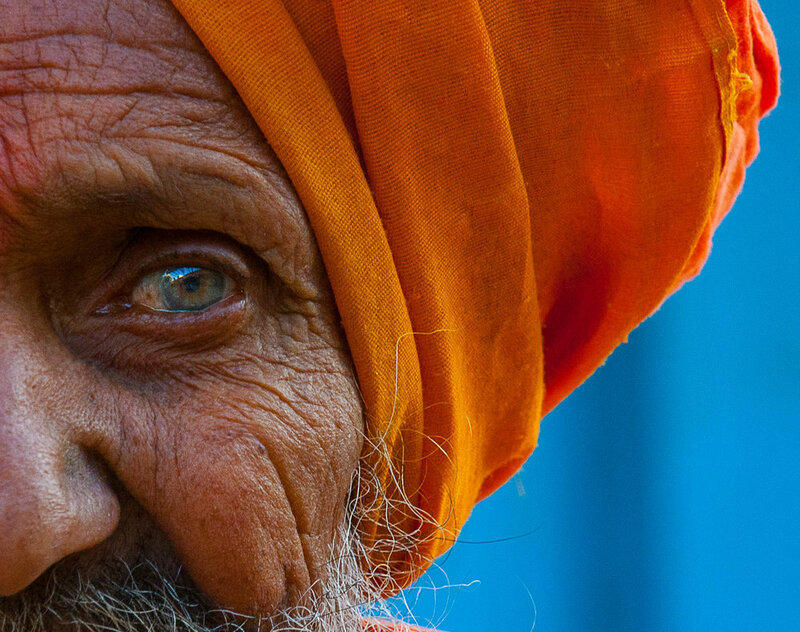 The camera is your tool, and using the principles of photography, you will refine your vision, delving deeper into the shapes, patterns, fabrics, colors, textures, and faces that make India unique. She is the 5-star luxury converted palace hotel, and the simple thatched mud hut. The shiny shopping mall with bearded hipsters sipping cold brew coffee and the dusty bazaar street and its local chaiwalla. She is the hip yoga studio in Rishikesh and the serene mountain hangout of Manali. She is the beaches, parties, restaurants, whitewashed churches and flashy casino boats of Goa, and Rajasthan’s toppled palace ruins. She is modern and ancient, serene and overwhelming, clean and dirty, wise and idiotic, sophisticated and kitsch. And she’s inviting you now to come on an unforgettable adventure... To see her, experience her, and capture her in your heart and on your camera! A picture's worth a thousand words. And if you make it yourself, it's a priceless memory. But, before you learn more about what this Cultural & Photography Tour of India is, know what it is not. It’s not about becoming an expert photographer or even carting a 'proper' camera around on your holiday (your iPhone or smartphone will do just fine if that’s all you have). It’s not about wide depth of field, shutter speed, composition and exposures (although they’re all things you will learn more about). It’s about re-training the eye to see beyond the obvious and uncover the fascinating textures and faces of your surroundings. We explore unfamiliar territory within our travels...and within ourselves. 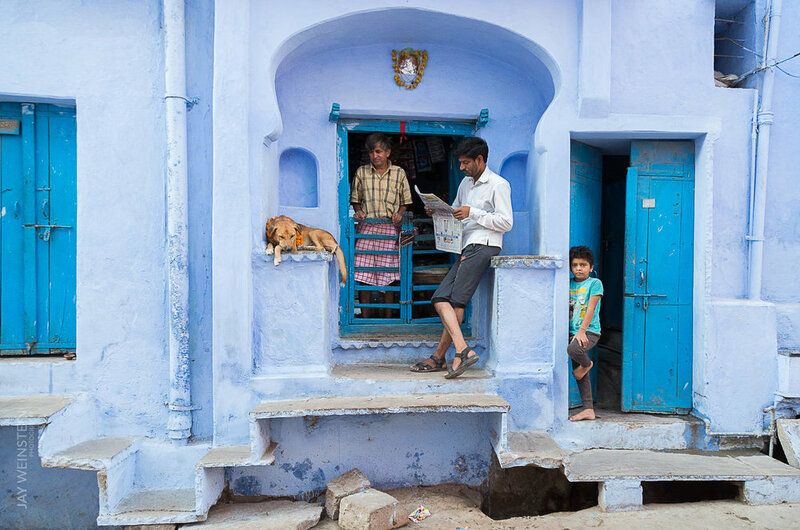 In the expert hands of international photographer and traveler Jay Weinstein, you will be guided on a cultural tour of India's picturesque state of Rajasthan. Whilst learning how to wield a camera with thoughtfulness and technique, you will respectfully interact with the people and places you visit, provoking you to notice details you’d otherwise miss. You'll learn skills, and practice making beautiful images you'll be proud to display. Because, let’s be honest, sharing photos from a trip with family and friends, as you regale them with stories and plot twists, can be as much fun as the adventure itself! 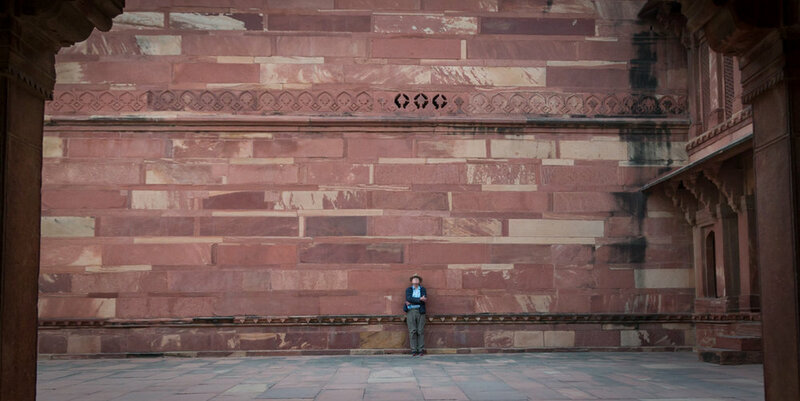 Your adventure begins in chaotic Delhi where you’ll be welcomed by your tour guide Jay Weinstein, a Mumbai-based, Hindi and English-speaking photographer of Australian-American heritage who’s been based in India for 25 years (hint: this means he knows his stuff and you’re in safe hands). Here you’ll meet your fellow adventurers who will make up your intimate tour group, before being transferred to your comfortable hotel in South Delhi to rest overnight. Today starts with a rickshaw ride around Old Delhi’s narrow chaotic alleyways. 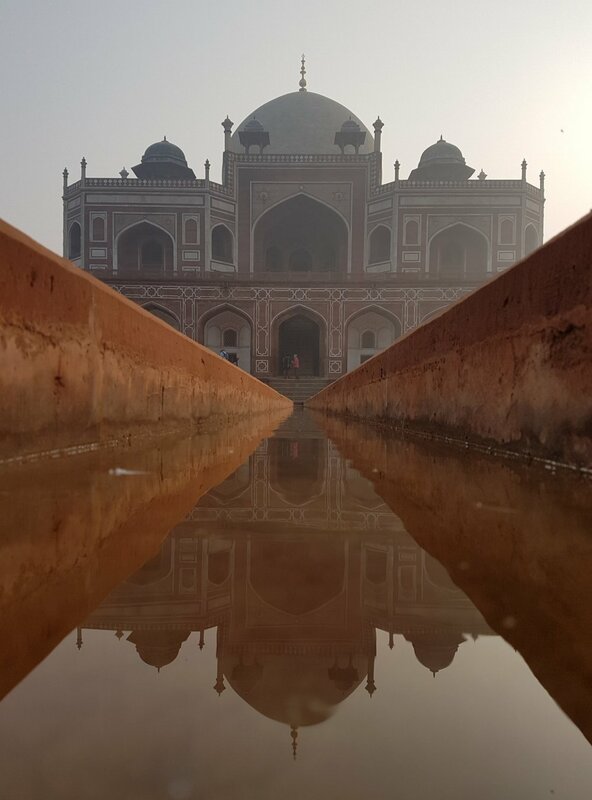 We pay a visit to Jama Masjid, one of the largest mosques in India, followed by Humayun’s tomb, the resting place of Mughal Emperor Humayun built in 1570, and now a UNESCO World Heritage Site. We then switch it up with a driving tour through New Delhi. Overnight Delhi. Today, we're up early for a drive to Agra where you'll see the exquisitely carved Taj Mahal, described as the most extravagant monument ever built for love. Following this guided tour we stop for lunch before visiting the fascinating ghost city of Fatehpur Sikri, an enchanting ghost city built in 1571 by the Moguls. Overnight Bharatpur. 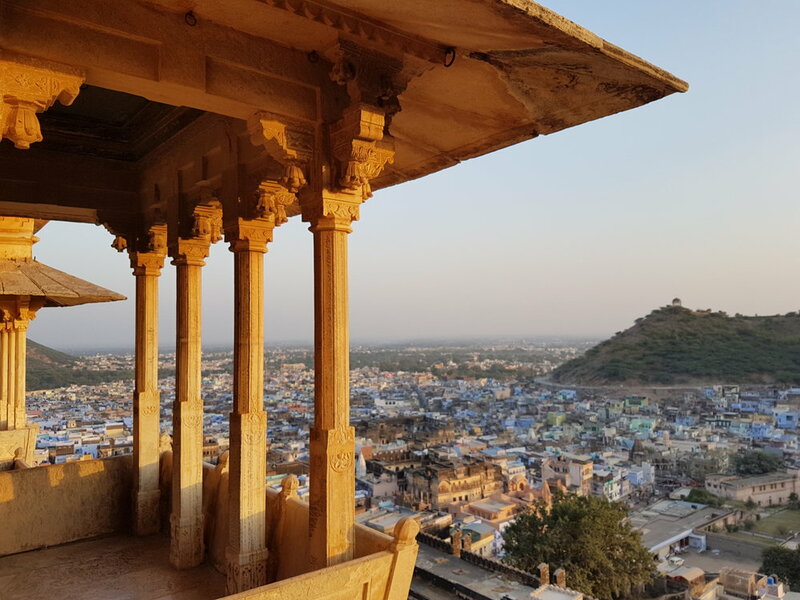 After an early cycle rickshaw ride around the peaceful Keoladeo Bird Sanctuary, we drive to the chaotic pink capital of Rajasthan, Jaipur, stopping en route to visit an ancient step well and temple. We visit the Royal City Palace, one of Jaipur's most famous tourist attractions, and the Hawa Mahal palace constructed of red and pink sandstone in 1799. Enjoy a guided tour of the magnificent Amber Fort followed by a visit to the inspiring Anokhi Museum of Hand Printing, a small textile museum dedicated to the ancient craft of hand block printing. In the afternoon, we have time to wander through the colourful bazaars, a sure treat for the eyes and your camera. After breakfast drive to Bundi, one of the most laid-back cities in India where you can relax with charming cup of traditional chai. In this captivating town we will explore atmospheric narrow lanes, ornate forts, blue houses, temples, bazaars and palaces. Immerse yourself in the tranquil ambience of this beautiful town where the friendly locals love to strike up a chat. After our morning guided tour, you can enjoy some free time in the afternoon to practice your photography. This morning we drive to Chittogarh, best known for its honey tinged fort constructed by the Mauyans in the seventh century, considered the greatest in Rajasthan. 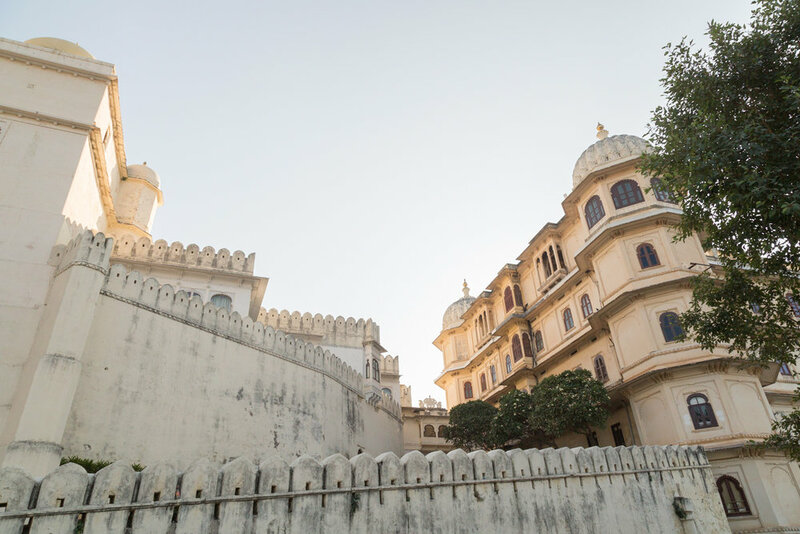 Being the citadel of many great Rajput warriors, its history is filled with chivalry and tragedy. After a guided tour and lunch, we drive to Jojawar, a small town in the foothills of the Aravali Range with a romantic past and a delightful heritage hotel. Today begin with an exciting jeep safari to visit villages of the Rabari people who inhabit much of the western desert of Rajasthan. They are a semi-nomadic people with a strong ethos of protecting the fragile environment that supports them. After lunch, we drive through the hills and board the special mountain-railway train for a wonderful scenic journey through the Aravali Range. Overnight Jojawar. Take some free time for fun activities like a cooking class, bird watching or horse riding ...and of course, photography! 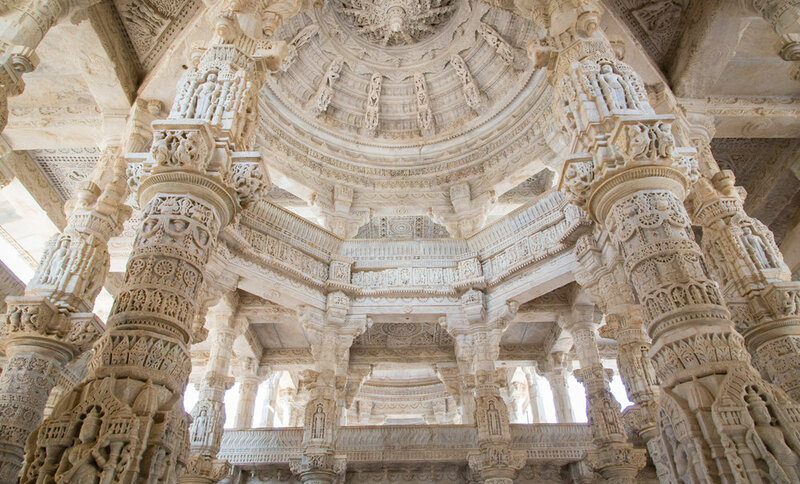 En route to Udaipur, we enjoy a stop at the Ranakpur Jain Temple with intricately carved marble interiors and the Kumbhalgarh Fort. From the extensive fortified walls the views extend for miles. Overnight Udaipur. While in Udaipur, we will have a guided tour of the majestic City Palace, Jagdish Temple, and the stately Bagore-ki-haveli. We also have free time to explore the narrow crooked lanes of this charming town or the surrounding countryside and villages. Other options include sampling teas in the quaint tea shops or enjoying a nourishing Ayurvedic massage. In the evening, relax with a traditional folk dance performance. We visit the Shilpgram handicrafts village - a living ethnographic museum depicting the lifestyles, architecture and art of the folk and tribal people of the Western states. Late afternoon flight to Mumbai. 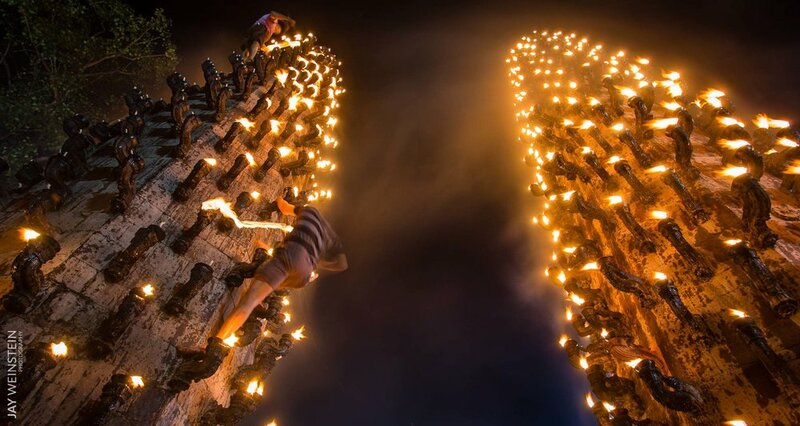 Experience the chaotic madness of Mumbai with some great sightseeing and time for shopping. We have a final group dinner before departure to the airport. All through the journey, you have the Mumbai-based international photographer, Jay Weinstein by your side, most notorious for approaching random strangers for his photography project So I asked them to smile. 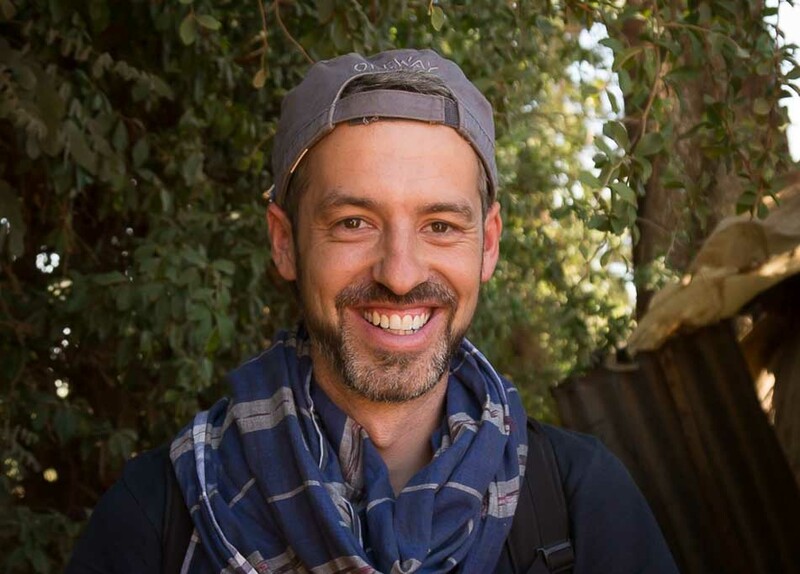 Jay moved to India at age 3 with his parents, both teachers on a search for meaning. Jay spent the next 12 years living in the historic pilgrimage town of Vrindavan, raised by his mother, an artist, and father, a philosopher. At 15, Jay’s family moved back to Australia for his secondary education. We’ll skim over the part where he moved to LA to be an actor at 21, ended up in advertising and eventually fell into photography and travel. Jay kept thinking he was done with India, yet he returned year after year, finally moving back to Mumbai in 2004 where he’s been based since. His love of sharing India was reignited through his photography, which forced him to explore the country with fresh awareness. Touch of Spirit Tours has now grown to include over 12 tours, spanning north and south of India, Nepal, Sri Lanka and Tibet. We’ve thrived because of our glowing reputation from past travellers who’ve journeyed with us through cultural experiences, self-discovery, health and spiritual fulfillment. It also enables us to practice “safe spontaneity” - i.e. Participate in random unplanned activities like festivals, parades and weddings without displacing the itinerary or risking cultural offence. Being in an unfamiliar environment, especially one as unpredictable and foreign as India, it’s natural to feel overwhelmed and be concerned about safety and offending anyone. How should I deal with a tuk tuk driver and a broken meeter? If you find yourself nodding along to at least 4 of the below points, then chances are this tour was made for you! You’ve always dreamed of visiting India, but feel a tad intimidated by the idea of actually going. You have access to a camera (even the one on your phone) and are willing to use it. You're interested in photography - a complete beginner to intermediate level - and keen to expand your skills and practical knowledge in a stimulating and creative environment conducive to learning and experimenting. You want to travel with sensitivity and an eye to how to avoid potential problems caused by inexperience. You love connecting with likeminded, positive, interesting people from all walks of life. While you’re ready to escape the familiar and experience authentic India, you still want to be comfortable and feel safe under the guidance of an expert who knows India like the back of their hand. Sound good? Let’s move on. Memories of a lifetime (captured by you)!